If you have a honeysuckle plant flourishing nearby, a surprising medicinal plant is right at your fingertips. One of the most important herbs in Traditional Chinese Medicine, this fragrant beauty is much more than just an ornamental vine -- the flowers exhibit antibiotic, anti-inflammatory, antibacterial and antiviral properties as well. The "Echinacea of Chinese Medicine"
Considered an effective tonic for the heart, honeysuckle is used as a remedy for a wide range of cardiac disorders. The plant also addresses ailments of the skin and liver, asthma, arthritis and swollen glands. Similar to its cousin elderberry, honeysuckle is exceptionally antibacterial and antiviral -- so much so that it's deemed the "Echinacea of Chinese Medicine" by Michael Tierra, C.A., N.D., O.M.D. The flowers are used for infections as well as inflammation and have been found to be effective against Salmonella typhi, Pseudomonas aeruginosa, Staphylococcus aureus and Streptococcus pneumoniae. In eastern Asia, honeysuckle is traditionally used to treat dysentery, conjunctivitis and inflammation of the urinary tract and reproductive organs, along with fevers, colds and influenza. Flower extracts are helpful in reducing cholesterol levels, lowering blood pressure and treating tuberculosis. Externally, honeysuckle tea can alleviate rheumatism, sores, tumors, scabies, swelling and boils. As observed by herbalist Kiva Rose, honeysuckle is "most suited for hot, feverish and acute problems as well as to overheated, hot excess people and not so much for the cold and deficient as it is very cooling in temperature." She added, "Based on my experiences with the plant, it seems to impart a sense of presence and appreciation of surroundings, allowing one to release tension or anxiety and be fully in the moment." "L. affinis, flowers and fruit; L. angustifolia, fruit; L. caprifolium, fruit, flowers to flavor tea; L. chrysantha, fruit; L. ciliosa, fruit, nectar; L. hispidula, fruit; L. involucrata, fruit; L. kamtchatica, fruit; L. Japonica, boiled leaves, nectar; L. periclymenum, nectar; L. utahensis, fruit; L. villosa, fruit; L. villosa solonis, fruit." As explained in Acupuncture Today, "The typical dose of honeysuckle flower is between 6 and 15 grams, decocted for oral administration, depending on the condition being treated. Larger doses can be used when the herb is applied to the skin." For honeysuckle syrup, place 4 pounds of fresh petals in 1 quart of boiling water. Remove from heat, cover and infuse for 12 hours. Strain and add 4 pounds of organic sugar. Simmer over low heat until syrup forms, stirring occasionally. Take one teaspoon daily. If you don't have fresh honeysuckle available, dried varieties can be found at Asian markets or suppliers like Mountain Rose Herbs. Many health food stores also carry honeysuckle decoctions, infusions and powers. Caution is advised when ingesting the leaves or stems of honeysuckle, as they contain saponins, which can be dangerous if taken in large enough amounts. 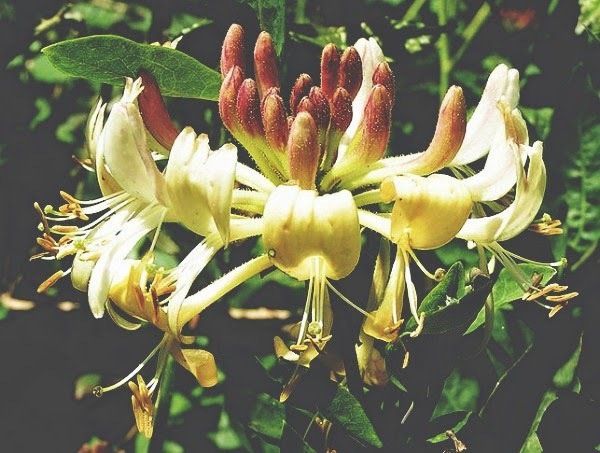 There are no known drug interactions with honeysuckle flowers, but it's always a good idea to consult with a licensed medical practitioner before use.